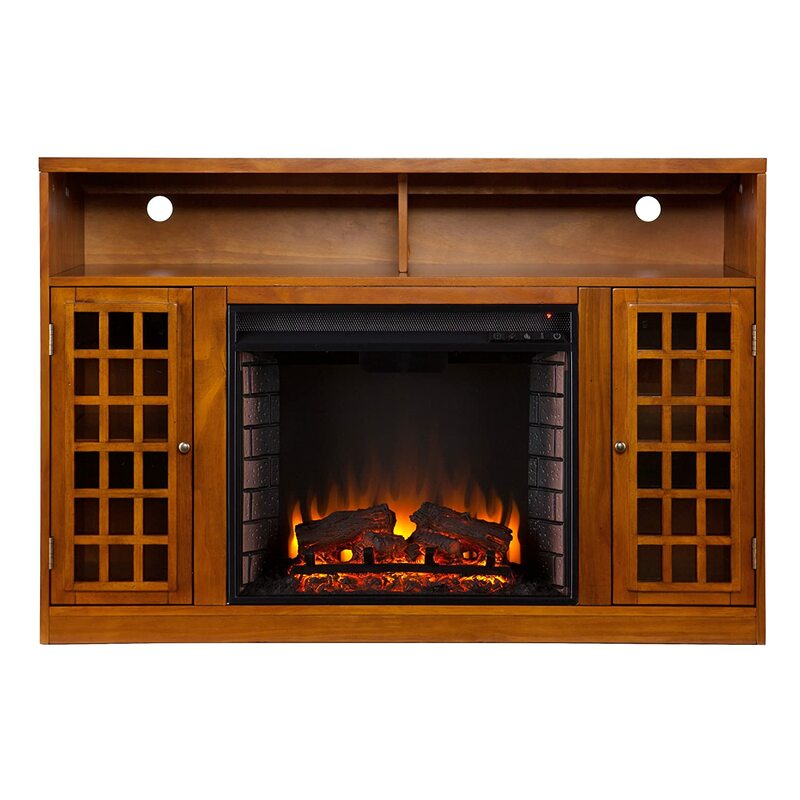 Welcome to our comprehensive review of an electric fireplace with mantel. the SEI Narita . Thanks for reading this Narita Media Electric Fireplace review. Our aim is to explain all of the major features and benefits of this fireplace so that you have all of the information that you will need to make a purchasing decision. Included in this review are the pros and cons of this media fireplace and these are summarized from customer reviews. This electric fireplace media center is made by SEI – Southern Enterprises Inc. I spoke with a customer rep and discovered their firebox is used in several different cabinets. They are primarily a furniture company. SEI found a good firebox and they stick with it. The flame effect they go for are natural colors. There are no fancy light shows. Just good natural looking fire effects. The firebox does not use any combustible fuels so there are no fumes or pollutants emitted. The realistic flame and glowing embers are powered by energy efficient LED’s which are very long lasting and need no replacement. The burning logs can be adjusted for brightness and the height of the flickering flames can also be adjusted. Lifelike multicolor flames and burning logs with embers; Dynamic embers effect pulsates dimmer to brighter for an authentic look; Classic brick style interior and optional down light illumination; Long life, energy efficient LED bulbs. This fireplace supplemental heat for up to 400 square feet. Accommodates a flat panel TV up to 46″ W overall and conveniently plugs into a standard wall outlet a with 6′ cord. The heater uses a standard 120 volt 60 Hz outlet and can output 5000 BTU’s at 1500 watts. There is a thermostat to control the heat setting from 62° to 82° in 4 degree increments. The heater unit comes with a thermal overload protector for added safety. There is a high and low fan option and the infrared heat feels natural and will not make the air in the room dry. This fireplace can be controlled manually from the pull down panel at the top of the firebox or through the infrared remote control which is supplied with the unit. The fireplace can be turned on or off and there are further controls for the brightness of the burning embers and the height and intensity of the realistic flickering flames. A remote control is supplied as is a manual for assembly. The color of the unit is Espresso (darker) or Pine Oak (lighter). Make your choice when ordering. Links for both can be found at the beginning of the post. Buyers were impressed with the over all value the unit presents. The price of the unit was commented on quite a lot. A lot of people felt that this fireplace offered very good value for money with features that could only be found in units that cost a lot more. Lastly, customers were very satisfied with 2 key points – flame effects and the heater. There were comments about how realistic the flame effects were as well and the overall ambience that the unit provides. The efficiency of the heater was mentioned by a lot of customers and there were comments about how well it heated rooms and how quiet the fan assisted heater was. The following negative comments about the fireplace are summaries from real customer reviews. we find it off that sometimes the exact same items cited as strengths, someone point s out as weaknesses, as is the case here. “It is difficult to assemble this fireplace” – a couple of people commented that they found the fireplace very difficult to assemble. One said that it was so difficult that they sent the fireplace back. This is contrary to the majority view where most people stated how easy it was to assemble the unit so this is not considered a big issue. “The quality of this unit is not good” – one or two purchasers were not satisfied with the quality of the fireplace. One said that they felt it was made out of “sawdust and glue”. Again this is contrary to the opinion of most of the customers and this should not put you off buying this fireplace. It assembles with a screwdriver and wood glue. “The fireplace didn’t work” – one customer was unhappy because the fireplace did not work when they turned it on. The flames were frozen and there was a loud noise when it was switched on. This was a single complaint and the unit can be replaced for a fireplace that works properly. That is the advantage of Amazon’s return and guaranty policy. There were a large number of reviews left for the Narita Media Electric Fireplace. From the customers that left a review, 64% of them awarded a 5 out of 5 star rating, and a further 21% awarded a 4 out of 5 star rating. This gives a combined total of 85% for this model which is good. 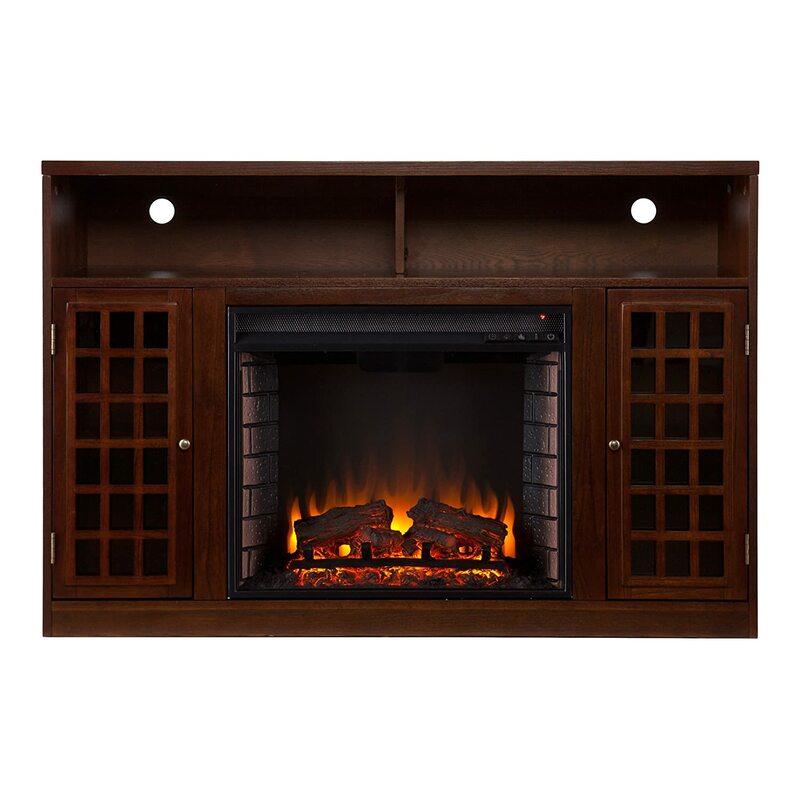 This fireplace is stylish and provides excellent features for media storage. It is good value for money and the flame effects are pretty realistic. The heater does a good job in heating rooms efficiently and overall we would recommend this unit.